When the globalist’s central bankers are in control, primarily the US/UK, they are proving their ability to supersede the natural forces of supply and demand with impunity. When they have the ability to “print” unlimited amounts of fake fiat, no other country can stand in the way, not even China. On the other hand, neither China nor Russia wants to oppose the globalist forces of evil, for both of those nations see what is unfolding on the world’s stage is the kabuki theater death dance of the US and the inexorable fading away of the fiat Federal Reserve Note. All that is going on in the world, especially in the Middle East, is about money and control, and the US is strong-arming every nation it can to use the “dollar” has a reserve currency, but more and more countries are turning away. War and destruction is all the US knows n order to get its way. The world is worse off because of it. The insatiable demand and lessening supply of silver, the sovereign buying of Western gold, emptying as many vaults as have gold, by China, and very legitimate fundamental considerations mean nothing, absolutely nothing. It is an exercise in folly to assess the reality of diminishing supply and increasing demand as a basis for expecting PMs to move higher. A look at the charts says the exact opposite. There have been some incredibly laudable analysis from several experts on how and why the fundamental factors for gold and silver cry out for higher prices, while at the same time, price continues lower creating a bit of understandable anguish in the PMs arena. While what is being said may seem negative, one has to keep one’s head while the monetary forces of destruction play out their end game. At some point, reality will set in, and here is where it really gets negative. Will the globalists force WWIII, or something very close to it? The globalists are interested in one thing and one thing only: “money,” which is hard to define because fiat is debt, and debt cannot be money. Gold and silver used to be the best measure of money, but they get in the way of the globalist control of the world’s money supply, actually non-money supply, to which the world dances, and not very well. The biggest answer, for which no one knows is, When? When will the insanity that rules this sad world lose its grip, and at what cost to the remaining 99.99% that are subject to the whims and rules of the ultimate money game and money rulers? As individuals, we cannot control what goes on. All any individual can do is be in control of him/herself and act in one’s best interests. The globalist’s financial world is spiraling out of control. People have as many warning signs as they choose to see, while most choose not to see because it goes against the lies they have come to believe as truths. There is a 5,000 year history, or however many years of proof, that all fiat money fails, and that includes the so-called “dollar,” the phony Euro, the worthless Pound, the Yen that refuses to bow to reality, as globalist fiat “unreality” maintains control. In each and every instance of a failed fiat, it always took longer than most expected, and the fiat “dollar” is the final king of fiats that is next to fail. When? We certainly do not know, and based on all other so-called experts, none of them have any idea, either. So the focus has to be on protecting our financial self-interests as best as can be done in a growing tsunami of uncertainty. The most reliable and proven certainty, in a financial sense, remains gold and silver. Paper gold and silver are worth what the paper is, and no more. Count on that, even if it is a piece of paper from a Swiss bank that says you own allocated and numbered gold and silver. Take it as a lie, and that you can take to the bank, for those who still choose to use one. All that matters is physical gold and silver. As with paper, the price of physical PMs also has been going down. Those who choose to measure the utility of owning gold and silver in terms of price alone have lost a sense of their true utility, a storage of wealth. There are times when the “store of value” is negative. The cost of insurance is negative, so why carry any for self, home, car, etc? Insurance has no value if it is never used, yet people have it all the time. Why? Because they do not know when it will pay off to have it. In the final analysis, one either believes gold and silver are a valuable form of insurance, or not, and any form of sophist reasoning does not matter. We choose to appreciate the value of gold and silver throughout history, and we recognize there are and have been times when holding them was a losing proposition, albeit temporarily. In Chicago, 2 weeks ago, 100 oz silver bars cost $1,530, readily available. One week ago, a bar cost $1,490. What are the odds of silver dropping another $1 or $2 “dollars? That would result in a $100 – $200 loss, but only on paper. At some point, the odds of silver going to $20, $30, $40 the ounce are very probable, maybe even higher, which means it just gets better. Why should one be concerned over a potential decline in “value” [only on paper, so unrealized] while the world is fast going out of control, and owning silver, or gold, can result in substantial gains? The gold:silver ratio has reached 78:1, last week, vacillating between 75:1 and a little higher. For this reason, we favor silver over gold, even exchanging gold for silver. The charts may not show a turnaround, at this point, so the when question remains in play, but so does the why question, as in why own PMs? History favors the why, and so does the future. We continue to recommend the purchase only of the physical PMs. The charts show the ongoing and uncertainty of being able to answer the when. All we can say is, it just is not yet. Time to show the annual and quarterly charts, not for timing, but because they show as true a picture of developing market activity as smaller time frames in terms of persistent direction. The annual shows wide range bars down with lower end closes, all typifying weakness. 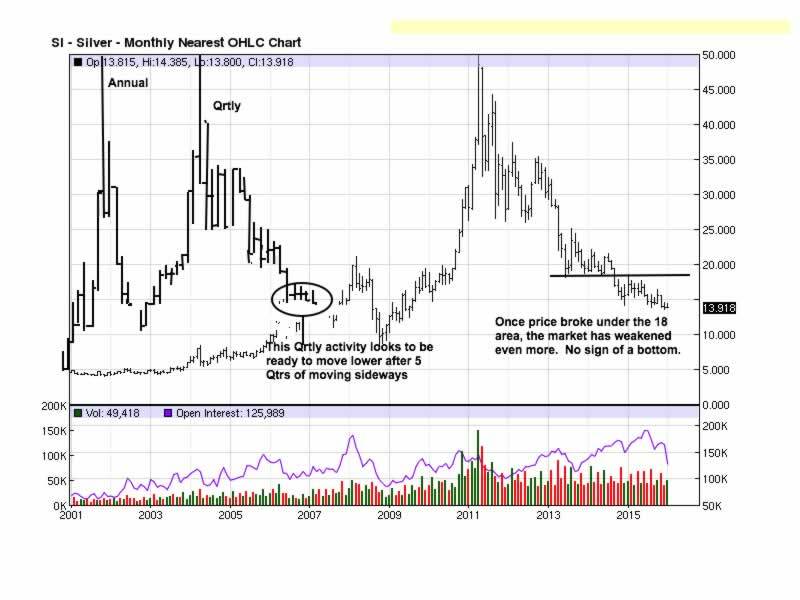 The Quarterly shows the same with potential support at 1,000, and should that price level fail to hold, down to 900. 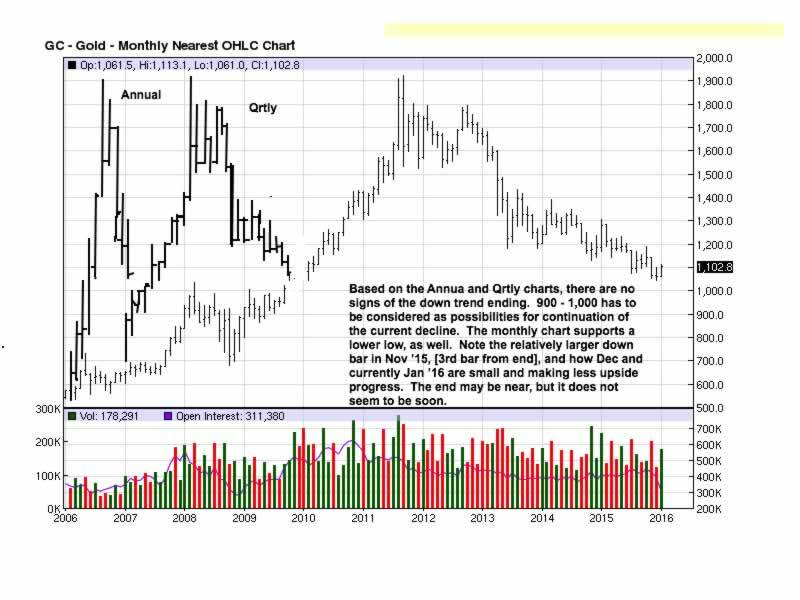 The monthly shows the same potential support at 1,000 based on prior developing activity from 2008 and 2009. Simply as a general measure, but not considered absolute, a half-way retracement indicates the character of a trend. In a down trend, price usually fails to reach a 50% swing retracement indicating a continuing weak market, to stopping at/near 50% before resuming the trend lower. It is when one sees price rally above, and hold, a half-way retracement that it could portend a change in market behavior. Right now, a potential for change is absent, so there is no definitive answer for when. You get a clearer example of what a 50% retracement looks like, and how this one has failed to reach that level, an indication of a still weak market and why the probability for lower prices is greater than not. Overlapping bars and a clustering of closes indicates either a stopping or resting point before the existing trend continues, or it can lead to a change, as in reversal, of a trend. On the Qrtly chart, the closes are all mid-range to lower on each bar, and that tells us sellers are stronger than buyers, so continuation lower is the most likely outcome. It does not matter how much wants to embrace the strong fundamentals favoring silver, the charts reflect current market assessment, and all participants know all that is to be known about the fundamentals, and price is still making lower lows and shows no ability to rally. Here is how the message from the market is clear and simple without being misleading. Facts are facts, and the logic is irrefutable. The same cannot be said of opinions, so ignore them and deal with what is. Here is the proverbial picture worth 1,000 words. Scan this chart from left to right. One does not have to be much of an analyst to conclude the market direction and determine there is no visible sign of change. While the when remains unanswered, you have a definitive answer that it is not right now or even in the immediate future. For the past three years, the charts have not mislead anyone who takes even a cursory look to see where price is and has been headed. Fundamentals, for however real and accurate they may be, have been misleading all throughout this down trend. Anyone who says charts cannot be relied upon does not know how to read them and is not a source that has validity, just an idle opinion that is consistently wrong. 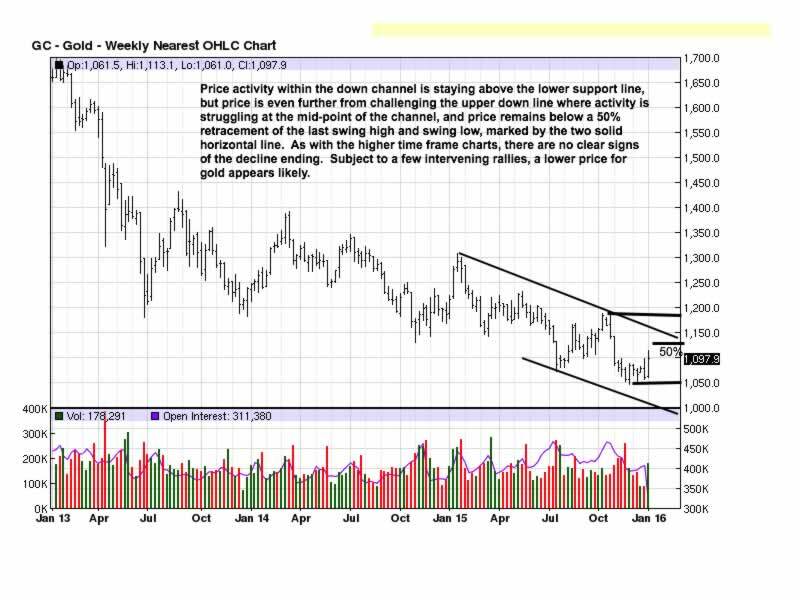 We mentioned how overlapping bars can lead to change as well as continuation of the existing trend. Why would a read of the rectangular activity not suggest a change may be in the making? For one thing, all of the activity is under 14.50, so 14.50 is resistance. Look to the left, and you will see 14.50 acted as primary support, July through September of last year. Whenever you see sideways activity that is under a previous sideways move, odds favor the current activity is weak and will lead to lower prices. Next, note how price fails to even approach a 50% retracement, clearly a sign of ongoing weakness. These are two indisputable facts about which no reasonable person can disagree. Finally, note the highest volume bar from last Thursday. Volume equals effort. Exceptionally high volume is usually smart money actively involved. Rarely, if not never, is high volume the result of small traders acting in unison to create that level of activity. Small traders react rather than proactively act. What were the results from all of the volume effort that led to a strong close on the bar? Nothing further to the upside. Apply logic to the observed fact. 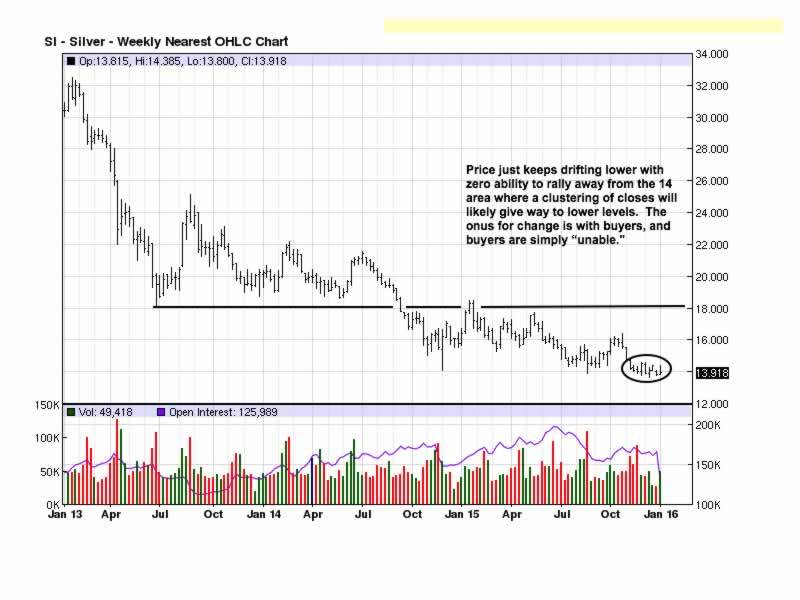 If all that buying effort could not rally price more, who is in control? Not buyers, they expended all that effort to no avail. Plus, next day, Friday, all of the upside effort was erased with a close under that effort, trapping all those who bought. This is an example of strong-handed short sellers selling however much buyers want to buy and leaving them under water right away. Also, this is another example of why one never wants to position against the trend. Reading charts is not rocket science. It all comes down to facts and applied logic which are highly reliable. 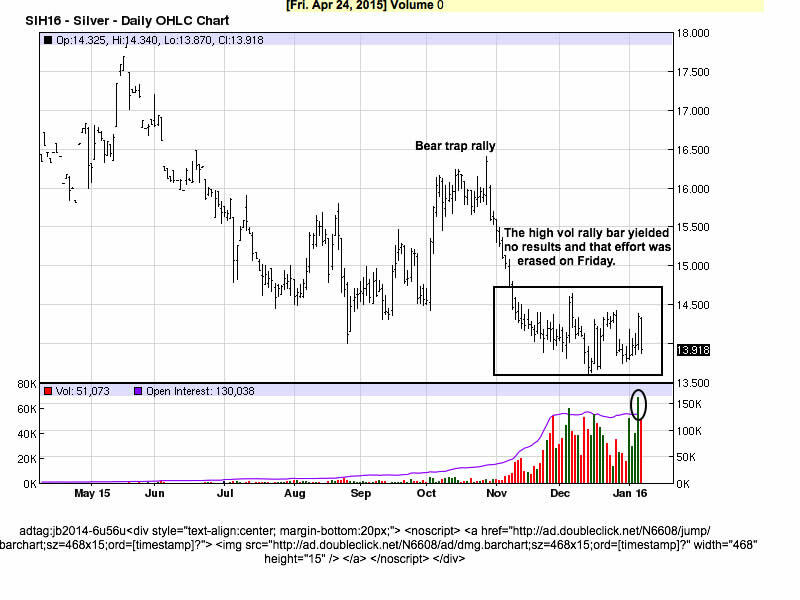 The bear trap rally, identified on the chart, was a legitimate place to buy, based on developing market activity. However, once it failed, one had to bail out and take immediate loss. It happens. 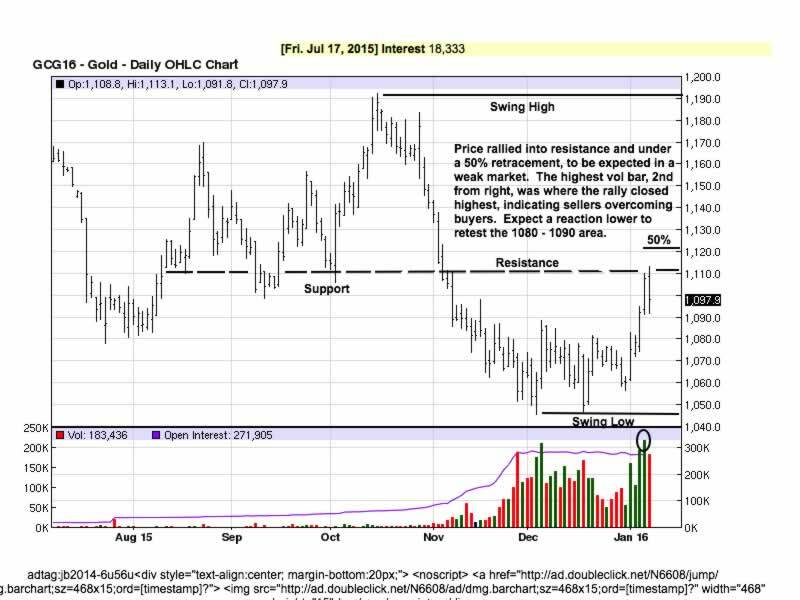 For all the information these charts convey, it is not unfair to suggest price is likely to go lower, nor it is unfair to expect anyone armed with this knowledge to be disappointed that gold and silver are not going higher, for now. For all the reasons given, expecting price to rally would be an unreasonable position to take, and one that takes no sense. This has nothing to do with the why of buying and holding physical gold and silver. In the end, the why is considerably more important than the when, and when does not mean if. © 2015 Copyright Michael Noonan - All Rights Reserved Disclaimer: The above is a matter of opinion provided for general information purposes only and is not intended as investment advice. Information and analysis above are derived from sources and utilising methods believed to be reliable, but we cannot accept responsibility for any losses you may incur as a result of this analysis. Individuals should consult with their personal financial advisors.